Now that I’ve traveled through France in July, I’ll be making my way to the Southern States via a neat new challenge hosted by Curling Up With A Good Book. We can choose to read books, watch movies, or find a favorite Southern recipe to share. “The Help”, “The Dry Grass of August, and “Saving Cee-Cee”. 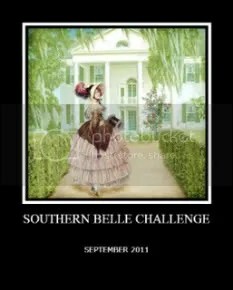 This entry was posted in Adult, Books and tagged Reading Challenge, southern belles. Bookmark the permalink. Any Faulkner in your plans? Haven’t read him in a while and would like to revisit his mastery. I was planning on using the entire month of September to get through Gone With the Wind, but if you have a good Faulkner book to recommend, one that you think I’ll like, I’m open to suggestions! I’ve been wanting to read Sanctuary. It is one of his easier works I hear. Despite that, I would definitely recommend As I Lay Dying or the Unvanquished. And of course, there is always the masterpiece The Sound and the Fury. I read Absalom Absalom when I was only 17 or so, and I think it went totally over my head. I’d like to read that one again, but not until I’m done with my goal to read my unread books. Intruder in the Dust is also good. I am making my way through Gone With the Wind and loving it. I hope that you are enjoying the Challenge. By the way, what are you reading today?